BBC News reported recently that a new world record is about to recorded in the area of matchstick replicas. David Reynolds, a former oil rig worker from Southampton, England, decided to build a matchstick replica of a North Sea oil platform. It took 15 years and four million matches to finish the job. He did it out of fun and to keep “the grey matter working.” The replica is so big it could not be put together in his own home and took two trucks to haul it to the Bursledon Brickworks and Industrial Museum where it is being temporarily housed. He got the matches to build his replica from friends and by buying wholesale to keep his costs very low. If he is certified by the Guinness people, it will beat the the previous Guinness world record that went to a 3.5 million-match replica of the Titanic. Sony BMG Music was sued by John Jorgensen claiming that his song “Long Lost Lover” was infringed by the songs “My Heart Will Go On” and “Amazed.” He argued that his tune was stolen as he had sent out unsolicited mass mailings of the song to record companies. Rewind and repeat: he sent out unsolicited mass mailings (aka spam) of his song to record companies. His appeal to the 2nd Circuit was denied as it agreed with the lower court that “corporate receipt of unsolicited work” is not evidence of a connection between those who received the emails and those alleged to have infringed the copyright. Jorgensen had no evidence to prove his claim and the defendants were able to show there was no connection. So the appeals court denied his appeal and he took it to the U.S. Supreme Court. Today that court rejected his appeal which means Jorgensen is out of luck. The court papers state he represented himself, so at least he does not owe a lot of money to attorneys. The lesson here is simple. Sending out copies of your work via unsolicited emails is not very smart. And proving they stole your music, which you sent by mass mail, is even more difficult to prove under these circumstances. Case dismissed. Bill Mechanic, former chief at 20th Century Fox Studio and involved with Disney’s home video, recently spoke at Independent Film & Television Alliance’s production conference in Santa Monica. According to Home Media Magazine he blamed studios for being more concerned about budgets than changing market forces. Good point. And if you already own “Titanic” or the three volume “Lord of The Rings” trilogy, are you willing to shell out more bucks for a blu-ray version? I suspect most people will not do so unless they are buying it for the first time. See The Titanic Iceberg In 3D! According to the Hollywood Reporter, movie executives are interested in re-releasing two of James Cameron’s movies, “Titanic” and “Terminator 2: Judgment Day,” in 3D format. But the newspaper reports that converting many movies into 3D will be limited to well known classics. Still, though several Hollywood majors also might tread that path eventually, only select projects are likely until 3D home entertainment takes hold, and that’s maybe five years down the road. Only the most well-known film classics would merit the considerable costs of converting 2D pics, not to mention the marketing expenses of 3D rereleases. I am somewhat baffled by this trend to 3D. When I was a kid it had been long discarded by movie studios. And for good reason as after a while it lost its appeal (it mainly was for horror and sci-fi movies). I just wonder how big the market really is for 3D. With all the advanced digital tech we now use and advanced computer rendering that is done, one wonders if 3D is just one of those niche trends that comes and goes with the wind. After all, do you really need to see the iceberg in 3D? 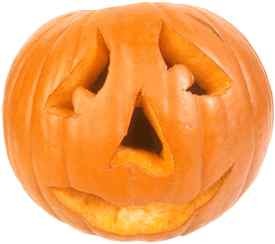 Since we have been on the subject of Titanic items of late, this image floated to the top during a recent search. At first I was not quite sure what it really was. 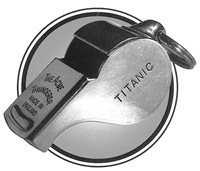 It is called “Acme Thunderer Titanic” but that name seems not really to say much about what this whistle will do. It seems to imply this is a very loud whistle that thunders above all others making it a titanic whistle of the first order. The whistle is in a British catalog called Judge’s Choice Petfood Ltd (By Appointment To Her Majesty Queen Elizabeth Petfood Supplier). It looks pretty cool and if anyone out there has actually blown this whistle, drop us a line here at Titanic News Channel. Over the years there have been are many “tacky” Titanic items offered upfor sale. There is a stuffed Titanic, a Titanic-Bot Transformer, a Rose doll (from Cameron’s Titanic), Christmas ornaments, salt and pepper shakers, and even a Titanic sinking game. But there is one that perhaps tops them all and it is by no means tacky to say the least. Consider the Jean Pierre Lepin Titanic Palladium Fountain Pen. The body with several portholes is fitted with a transparent ink fountain in which it is possible to see ink and piston. Lower down, you can see a propeller similar to the Titanic‘s and underneath the steerage of the ship protected by a sapphire glass cover. On turning the inking-roller, the piston pumps the ink, the propeller turns and needle of steerage starts to move . It is an extremely complex pen .Between the body and cap, there is the famous rusty ring made out of precious metal that was originally part of the Titanic. Screws similar to the rivets of the Titanic hold together the different parts. Different versions, limited to 88 pens per version, will be available and some with solid gold, diamonds and gemstones. Each part will come complete with the certificate from the shipyard to certify the authenticity of the precious metal. Group tickets are also available by calling 866-9-NYCTIX (866-692-2849). TSX is open seven days a week from 10am to 10pm. The whole event is part of a week long festival of music, food, and dancing including the hour long tomato fight. It apparently started back in the 1940’s either as a spat between merchants or disgruntled citizens throwing tomatos at politicians (one ought to remember that General Franco was in power at the time so a food fight might be the most benign way to show displeasure at Hitler’s good friend). This seems to be the year of Stanley Lord as we have another book examining his culpability that tragic night in 1912. The Titanic and the Indifferent Stranger written by Paul Lee is now out in an expanded paperback edition. According to the press release, the book is a 440 page detailed anaylsis that follows the controversy from its roots all the way through the books published for and against Stanley Lord, and the internal deliberations of the British government. “The Titanic and the Indifferent Stranger” is a 440 page detailed analysis of the case, chronologically following the controversy from initial press reports of the mysterious ship seen from the Titanic’s bows, to the pronouncements made in later years by authors keen to promote their books and opinions over their rivals. Assisting in Dr. Lee’s conclusions is the first printing of the internal deliberations of the UK Government as the campaigns to clear Captain Lord’s name in 1965, 1968 and the early 1990s were ignited by Lord’s friends. The bequeathed papers of Captain Lord’s foe and namesake Walter Lord, and the Captain’s ardent supporter Leslie Harrison have been scoured and provide a rich source of information on the tactics employed on both sides of the argument – culminating in a legal bid to suppress a book critical of the Californian and its crew. I have no doubt that both sides of the debate (the Lordites and Anti-Lordites) will be making their own appraisals known of Lee’s work in the near future (if they have not all ready done so by now). Signed copies of the book are available from the author’s site at http://www.paullee.com/book_details.php or you can buy it at amazon.co.uk.